**PROUDLY MADE ENTIRELY IN THE USAS. **SUPERIOR CONSTRUCTION using FInished and Sealed Solid Hardwood Legs and Solid Hardwood Side Frames which gives added Protection and Safety. **Built-in heavy duty mesh storage bag (patent) to retain blocks within the table and not scattered all over the floor like other table designs. **PREASSEMBLED so on the Legs need to be fastened to the table frame. 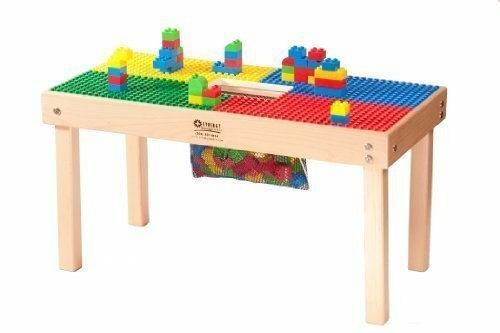 **Building Blocks are not included with this table. **AGES 5 AND OLDER with Lego® grid surface mainly designed for Lego® blocks. Built-In Heavy Duty Mesh Block StorageBag keeps blocks contained within the table and not on the floor!